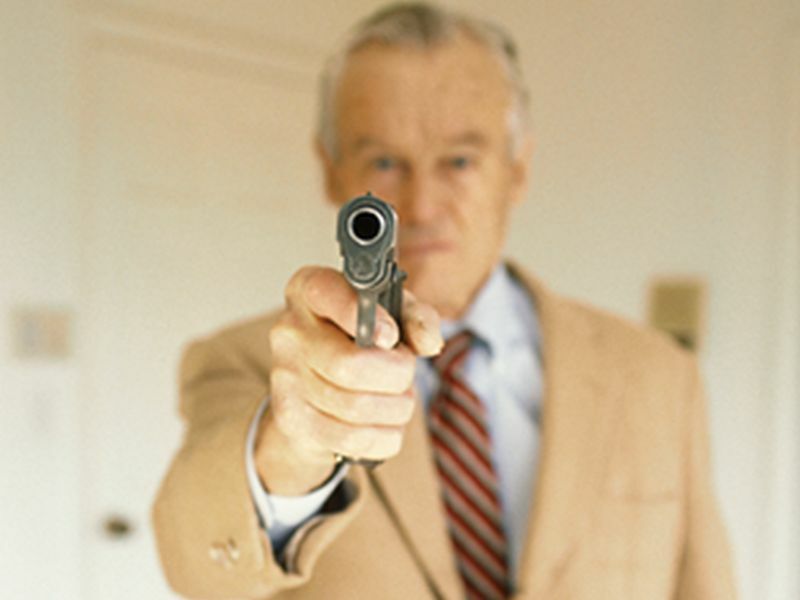 Almost 39% of the more than 4,400 seniors they surveyed in Washington state said they had a firearm in their home. Nearly a quarter said they keep at least one gun loaded and unlocked. Fewer than a third said they keep all firearms locked up and unloaded. These unsafe practices make suicide easier and endanger kids and visitors, researchers said. "Findings of this study highlight the importance of addressing access to firearms among older adults, especially those who display signs of dementia or suicide risk factors," said senior researcher Dr. Ali Rowhani-Rahbar, an associate professor of epidemiology. Every year, about 10,000 older Americans are wounded by firearms, he said. About 6,500 die of their injuries. And the risk of suicide is greater among older adults than among any other group. "We know that the overwhelming majority of firearm deaths among older adults are suicides," Rowhani-Rahbar said. Survey respondents who had guns in their home were more likely to be white, male and married. Men in rural areas and military veterans were more likely to keep their weapons unlocked and loaded. About 1 in 5 respondents with loaded weapons not locked away had been diagnosed with depression, the study found. About 1 in 8 had experienced memory loss in the past year. Easy access to guns is a special danger to older people with impaired thinking. People suffering from dementia may use the weapon to kill themselves or to shoot others because they are confused or increasingly agitated and aggressive, researchers said. Among older Americans, 91% of gun deaths are suicides. Given the link between mental decline and depression, researchers said having a gun at hand may be an avoidable risk. Although the study was done in Washington state, Rowhani-Rahbar thinks the findings apply throughout the country. "We need to do better to promote firearm safety among these households and practice policies devised to prevent firearm injuries and save lives in this population," he said. The way people with dementia and cognitive decline own and store their firearms is similar to other Americans, according to Dr. Megan Ranney, from the American Foundation for Firearm Injury Reduction in Medicine. "An important step would be to see how we, as a society, can best talk to older adults and their families about what to do with the older adults' guns as their dementia worsens," she said. Michael Anestis, a spokesman for the American Society of Suicidology, said getting older adults to give up or lock up their guns isn't likely to be easy, but some strategies can help. "We need family members and folks from law enforcement to get the message across about how guns relate to suicide and why it's important to store your firearms in a way that lowers risk," he said. Keeping guns locked up makes suicide harder, and just by making it harder, the risk drops, Anestis said. "Any obstacle we can put between a lethal method is going to help," he said. Emergency risk protection orders -- also called red flag laws -- that allow police to take guns away temporarily from people who are likely to harm themselves or others also can be a useful tool, he added. But family members are a big key to keeping their older relatives safe, Anestis said. "The car key analogy is really important for suicide with firearms," he said. Telling an older person that it's time to stop driving is a tough conversation, and telling someone that it's time to give up their guns is just as hard, because their guns are often an important part of their identity, Anestis said. If that person's thinking is impaired, the conversation is even tougher. "Ideally, they are planning for this ahead of time," he said. "I'd rather see folks storing their guns safely before we get to that point." The report was published April 15 in the Annals of Internal Medicine. To learn more about gun safety, visit Every Town for Gun Safety. Safety &, Public Health: Misc.